Oh....my....god! Thank you for this!!!! Hi Shot, I installed and ran the plugin as an Admin but it still shows the error. I just updated to the new blender version though. Would that be a problem? Is there a way to disable image compression, I'm seeing some noticeable degradation in image quality in the resulting atlas that I would rather avoid. For what it's worth, the Atlas panel in CATS (despite it using your addon) doesn't present this option, which is why I didn't see the missed it. 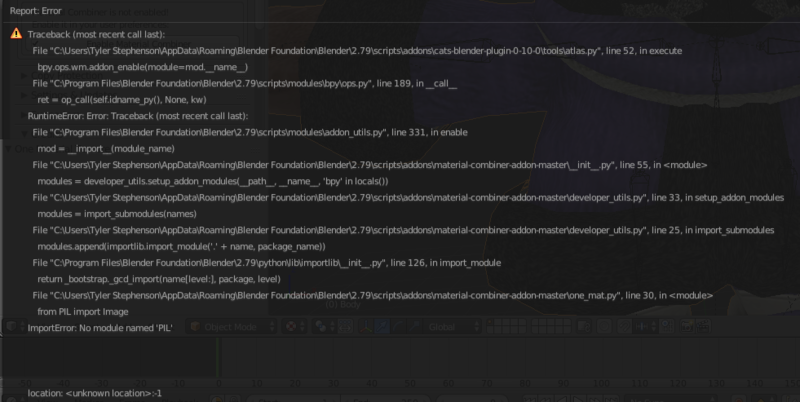 The newest version always show an error for me to restart blender no matter what i do. I lauched blender in amdin mode, any work around for it ? So I just updated the plugin and when I click to save Save Atlas to it ask me where to save the file and afterwords my model turns pink and wont load the texture. I checked the folder where I told it to save and its not there, it's the same folder my model is in. I tried it again leaving the folder open and it shows it saving but when I try to open it I get the msg you do not have permission to view this file then it deletes its self. tried going back to the older version witch I didn't have this issues with and all i get is the button to update. Hello, try to run Blender As Administrator and combine, if it will not help click at "Window > Toggle System Console" on the top panel of Blender and take a screenshot of the output it gives and send it here. running it in admin didn't change anything I also after seeing the system console I tried saving it to my main drive and got the same msg in the console. Hello Shotariya! I am trying to figure out your Multicombiner but cannot get it to work. I am unsure of the correct process. Could you provide a simple example guide? I've discovered a bug with the multi-combiner. However the normal texture specified in the multicombine step is a single texture stretched over the area of the two copies of the hair texture. Both the hair texture and it's normal map are the same size. Hi, when you do multicombining, you get a list of images that would be combined, and you can add for each image new 'layers' that will combine as different atlases with the main atlas, you can add an image or a color to the layer. If there's any images with layers and some images without, then for this images that will be auto declared as empty layers. Currenly you can't do multicombining with materials that has only color. So in other words, you add for each image their "addition textures", and each existed layer will be combined as new atlas by width/height of main textures applied to materials. Hi shotariya. Is there a new way to separate transparent mat from a new combined image? Like the old material combiner, you can change its combine ID.